After the meeting, Salvini became more outspoken against the pope, claiming that conservatives in the Vatican were on his side. In addition to supporting migrants, Francis has criticized nationalist movements around the world. 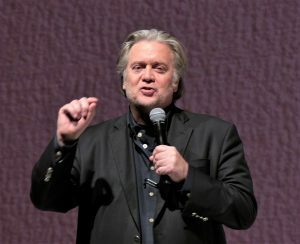 Now, it is true that Pope Francis wants something to rise up in Europe that the Bible opposes, but caution for Steve Bannon is advised as not all “right-wing movements in Europe” want to have anything to do with him. Steve Bannon, Donald Trump’s former adviser, has been stirring up a populist far-right movement across Europe. But France’s Marine Le Pen, in a joint press conference with Italy’s Mateo Salvini on Monday rejected Bannon’s efforts, saying that he was “not European”. French far-right leader Marine Le Pen distanced herself Monday from US President Donald Trump’s former advisor Steve Bannon, saying it was not up to an American to “save Europe”. Bannon has been increasingly visible in Europe in recent months, touting plans for a Brussels-based foundation called “The Movement” to spark a populist right-wing revolt across the region. Steve Bannon has been hoping to try to whip up support to breakup the European Union. I believe that Marine Le Pen’s comments reflect a growing anti-Americanism in Europe, partially stirred up by European distaste for US President Donald Trump. The Europeans are mad at the USA for many reasons (including its President Trump), the UK for the Brexit vote, and will decide that places like Canada are too connected to them to remain independent. Recommending attacks against the popular Pope Francis will not endear Steve Bannon (or the USA for that matter) to Europe. The USA and its Anglo-Saxon-Celtic descended allies will be defeated (Daniel 8:24-25; 11:39; Isaiah 17:3; Jeremiah 30:7). Many of the older Roman Catholic prophecies that mention the English were written before that area actually was called England (and of course, if any apply to the USA, Canada, Australia, and/or New Zealand, they were not formed as we now understand them until several centuries after some of the Roman Catholic prophecies were first written). Hence, these are errors, changes, and/or distortions in translations (probably often just a “modernized” translation of some form of the word “Anglo”). Yet, many of these private prophecies are believed to be intended to somehow refer to the British-descended peoples. While the Bible warns against the coming European King of the North Beast power, many Catholic prophecies look forward to this leader, under the name of The Great Monarch. The USA and Great Britain (including its Anglo-Commonwealth members, like Australia and Canada) were “great among the nations” and this was basically prophesied to Abraham’s descendants (see Genesis 12:1-2; see also Anglo – America in Prophecy & the Lost Tribes of Israel). The Bible is clear that betrayal is coming from allies, national FRIENDS! And the US and UK do not consider Russia to be a friend. The EU is not going to forget Brexit or Donald Trump, nor is it likely to forgive the USA for what Steve Bannon is trying to do. Despite having problems of unity (Daniel 2:41-43), the Europeans will one day reorganize and follow a leader that the Bible also calls the Beast (Revelation 17:12-13) of the Sea (Revelation 13:1-10) and the Beast of the Earth (Revelation 13:11-16)–which is likely to be a compromised pontiff. Trying to tell European leaders to attack the Pope will not work out well for the USA. This entry was posted on Saturday, April 13th, 2019 at 3:00 pm	and is filed under Prophecy.